Vintage Crochet–a New Appreciation – Love.Yarn.Shop. When I read the title, “Vintage Crochet,” I must admit my heart dropped just a tad. I imagined granny squares galore, but this special publication from Interweave changed my appreciation of the craft. The historical articles that open the magazine cover Irish crochet—in both Ireland as Bebe crochet and in Italy as Punto d’Iranda and Merletto di Orvieto—and an interesting assortment of other articles, including one charting the role of crochet in the Anne of Green Gables series by L.M. Montgomery. The patterns featured in this issue find their inspiration from family and film, and most are introduced with a brief background story. 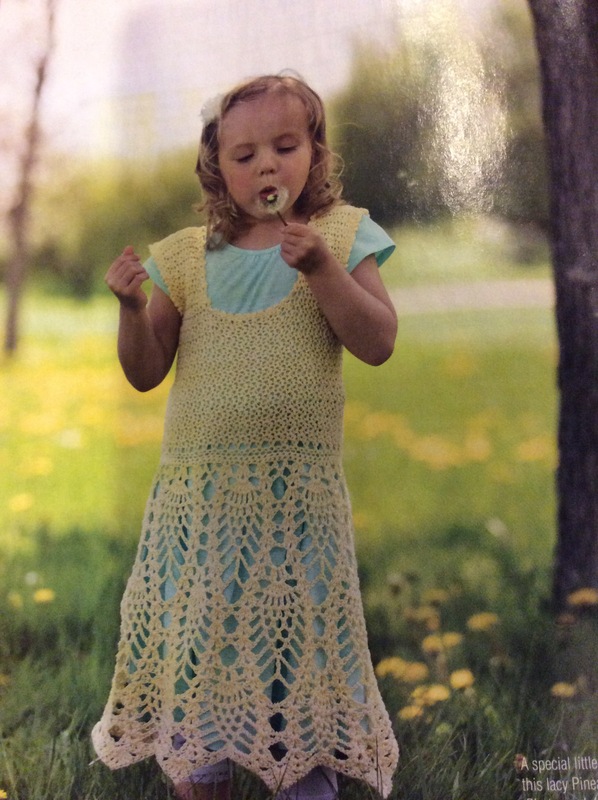 My favorite is a little girl’s Pineapple Dress, recreated by Tammy Hilderand from a reader’s 1946 picture of herself in her “favorite dress–ever.” The patterns range from shawls and skirts to peplum tops and pillows. And do you know? Not a granny square in sight.